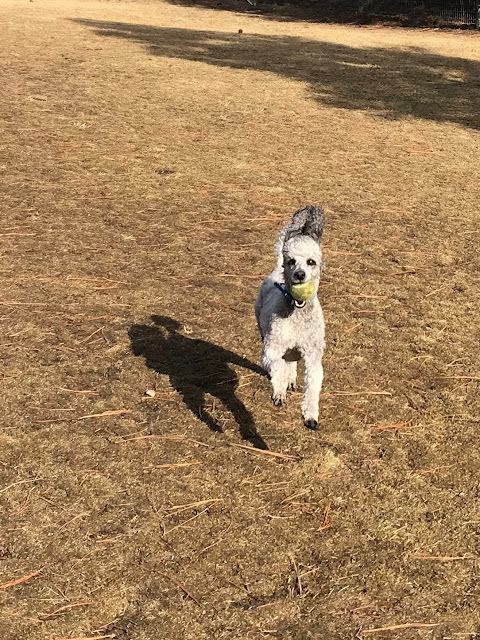 Dusty has learned that if he gives the ball to someone, they will throw it. Rocky did his share of running, although he can't compete with Dusty, but then because he runs more slowly, he noticed some nice people with treats. 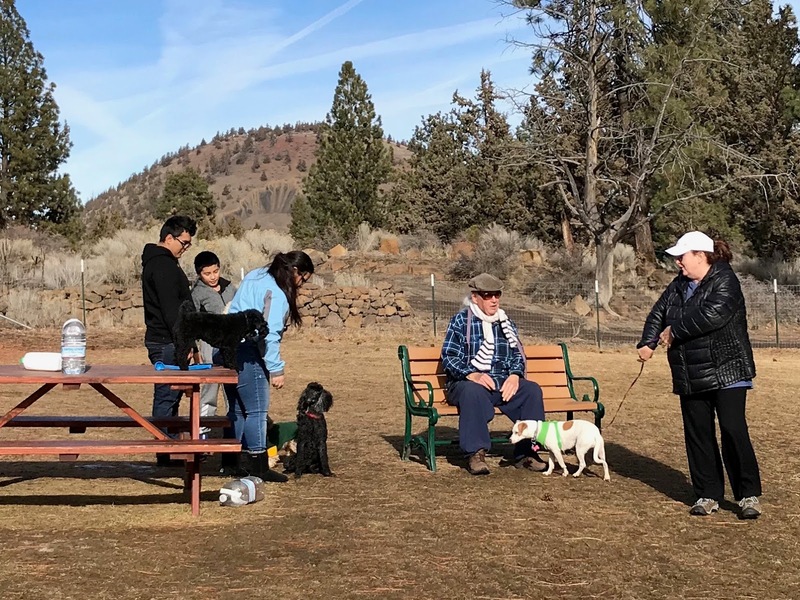 There were at least 30 people there, and perhaps as many dogs. Now that I'm recovering well from pneumonia, I have begun walking around the neighborhood with the dogs. 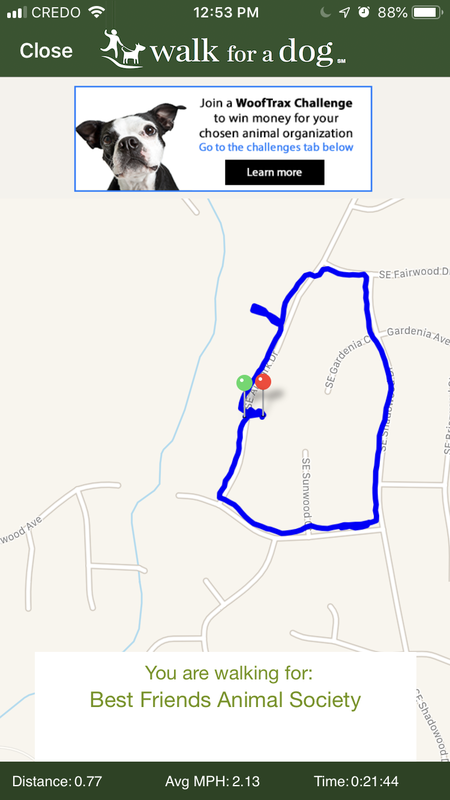 The first few days, the dogs and I (and sometimes DH) just walked around the block. 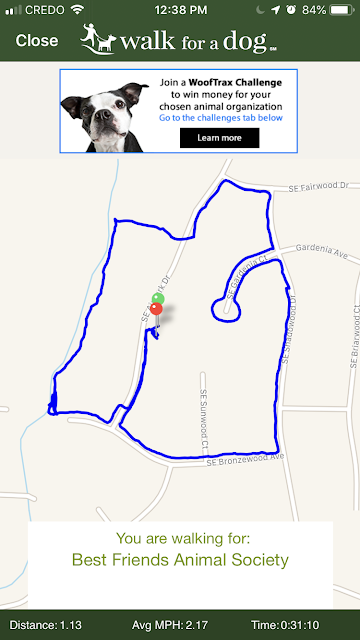 We use the Walk for a Dog app, so our distance walked helps Best Friends Animal Society. (They let you pick from a list of dog-related charities.) How much they donate and how often depends on how many people who are using the app have chosen a given charity. I get an email every once in a while to let me know that a donation has been made. The app and the donations are supported by advertising. Here was what I was doing for the first part of the week (just around the block, with a side trip to the poopie-bag dispenser at the trail). By Friday, I felt well enough to take a longer walk. We went out onto the Larkspur trail for a bit, now that it isn't so muddy anymore, and we added a detour down a dead-end street as well. We have added a couple of new items to the house. 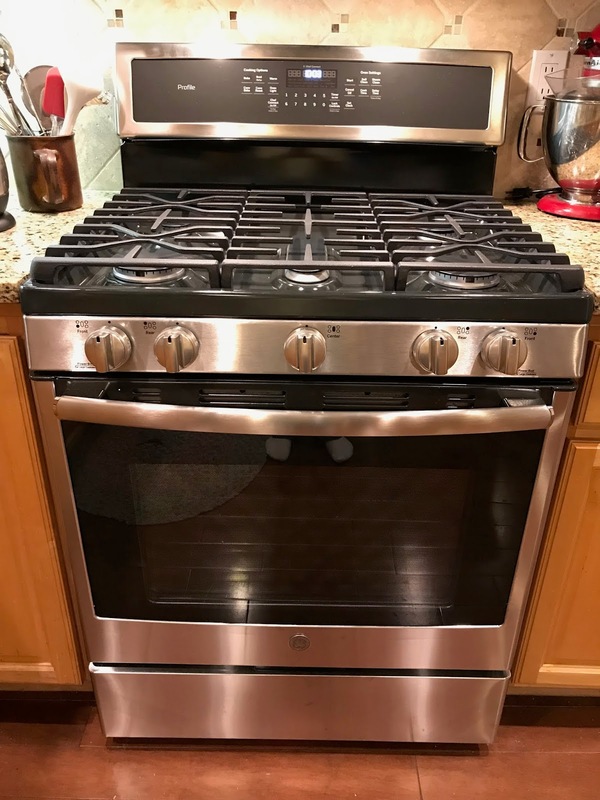 We bought the extra grate ($50) for the center of the stovetop to replace the griddle, which is heavy and has to be seasoned before it's used for cooking. I was afraid it was going to get stained before I could season it, so I took it off and put it in the drawer under the stove. The replacement grate came and is now in place. I'm very happy with this stove, and I haven't even used many of the features yet. 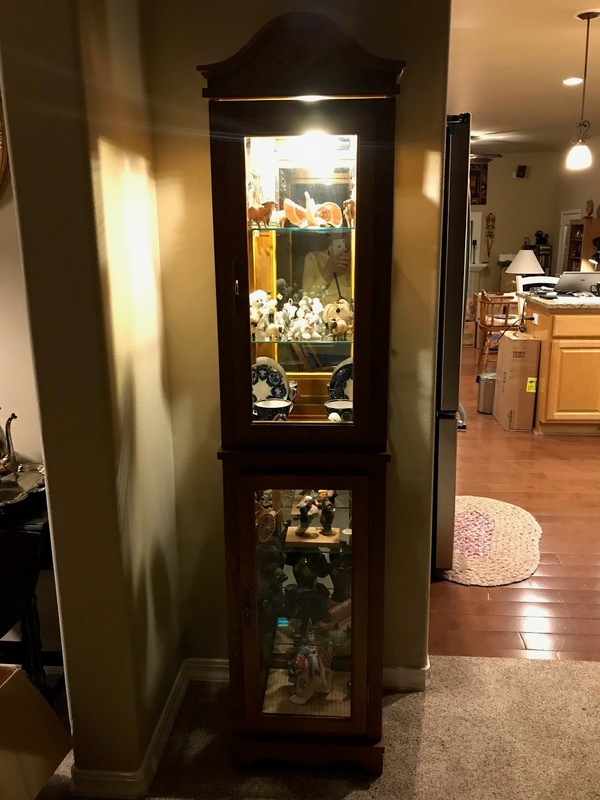 We also ordered a curio cabinet to hold all the little chotskies we have collected over the years. (We need to use the space in the china cabinet for actual dishes, as we have less storage space in our new kitchen.) DH had to assemble it, and then he found we needed extra glass shelves, so he ordered those locally. I went down a needle size to make it slimmer and worked the sleeves in the round instead of flat, making them 5 rounds longer in the stockinette section and adding an extra cable to the lower sleeve, so adding almost an inch to the length of the sleeves. I didn't add any length to the body, as I could see the cable section was going to fall about where her waist is, and that was what I wanted. 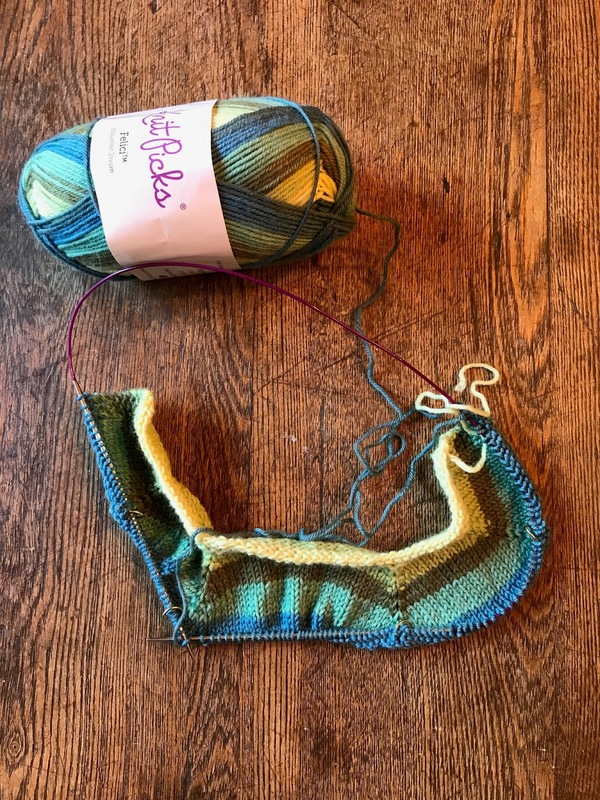 I already had the first clue for The Rose City Yarn Crawl's Mystery Knit Along (MKAL), so I CO and set to work as soon as Mariah's cardigan was finished. They also have a Mystery Crochet Along (MCAL) for people who prefer to crochet. Here is the yarn I'm using. 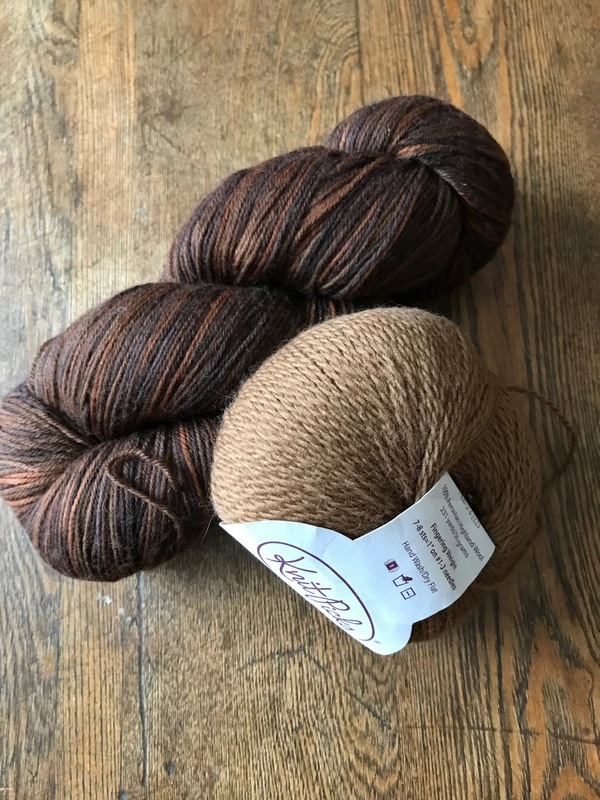 I "shopped" my personal yarn story (aka "stash"). Although I have finished the first clue, which uses the lighter solid color, I can't post a photo of it except in the "spoilers" thread for the Yarn Crawl on Ravelry. If you aren't participating, or if you are and you don't mind finding out how it's supposed to look, you can look here. My photo is in comment #237. I CO another Everyday Play dress on Saturday, as soon as I had finished my first clue for the MKAL. 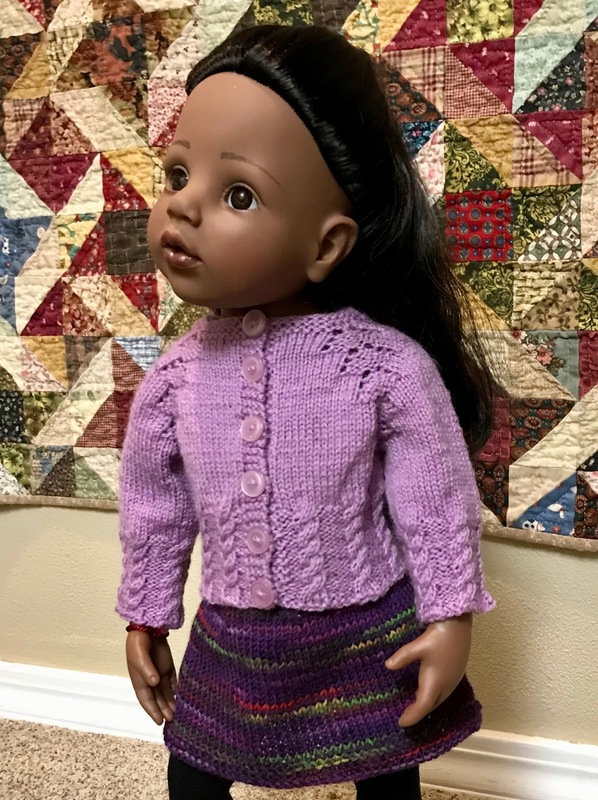 I want to see if going down a needle size would make it possible to knit the dress for Happy Kidz and Hannah dolls without changing the directions, other than to make the skirt longer. Here's what I had as of Saturday night. I still need to finish getting my fiber studio fixed up, including finishing putting the loom together, and we still have boxes sitting around, but I'm working on things a little at a time, trying not to overdo it. Laundry and cooking are about all I can handle right now, and I've started going to choir again, although my low notes sound rather froggy. I'm very grateful for my health, especially now that problems seem to be clearing up. a space blanket (they come in a small packages and can be found in places that sell camping supplies). A list of soup kitchens and homeless shelters is good to include, if available, and a note of encouragement is nice. People tell me that some of these people don't deserve my help. The way I look at it is, I would rather offer help to someone who doesn't really need it than pass by someone who is truly in need. And then there was that time when we had just moved out of our house and had no way to get into the locked storage unit where our food was until they opened in the morning. We raided our own homeless packet. After all, we were homeless at the time. What's on my needles: Finished the Janet Cardigan for Mariah, then the first clue in the Mystery Knit Along for The Rose City Yarn Crawl, which takes place in March. While waiting for the next clue (due today), I CO another Everyday Play dress, this time for Jolena. I want to see if I can get a good fit for Happy Kidz dolls by going down a needle size and then making the skirt longer. What's in The Doll's Storybook: Trouble at School, about dealing with bullies. What's on my iPad/iPhone: Finished Fear by Bob Woodward. Then listened to The Original Miss Honeyford by M.C. Beaton. Now listening to The Bride of Ivy Green by Julie Klassen. What's my tip of the week: Have a lot of stitches to cast on? You can use the long-tail cast-on without wasting yarn or getting to within 10 sts of what you need and running out of the tail of yarn. If I'm using a center-pull ball, I often take the strand from the inside of the ball and the strand from the outside, tie them together and start casting on using the strand from the outside of the ball as the long tail. When I get all the stitches on the needle, I cut the yarn from the outside of the ball and continue on with the strand from the inside. When you finish, you will have two extra tails to weave in, but that can be done quickly, and you can be sure you have enough tail without having to start over. I hope they stay well and the power doesn't go off! Good to see you are recovering nicely. We are west of the miserable weather but my younger son and his family are in the center. No school for at least 3 days. Yes, Rebecca! I have "The Cuckoo's Calling" in my Audible library. Nice blog post as always, Peggy. A couple of weeks ago, I recommended Robert Galbraith (J.K. Rowling) as a good read. I'm now on the third book of the series (there are currently four) and I'm wondering if perhaps you wouldn't really like them. Although all the books are about the same recurring characters, as I got into the second one, the tone changed quite a bit and if a reader isn't comfortable with very explicit language they might not enjoy the books very much. Just thought I should give you a heads up! The stories are excellent however - great mysteries and I like how he/she is developing her main characters.